Dogs love to run, jump and play so it's important to find great places to bring them where they can do just that. Located just across from the Eastside Walmart, Wiggly Field at Southeast Clarke Park has everything you look for in an off-leash dog park. For the dogs, a large fully-fenced area with both open field and some area with brush and trees for pets to explore. Part the area is fenced off for small dogs, in case they aren't up to romping with the general population. In the back of the large play area, also entirely fenced and with its own gate, is a fully-equipped agility park so you can train and practice your hound's best moves. The park provides pick-up bags, has water fountains for people and dogs (shut off in winter), and provides a full bathroom facility just outside the gate's entrance. There are benches and picnic tables for dog parents to relax while the pups play, and plenty of parking. Open until dusk throughout the year and there is never a charge. Memorial Park is conveniently located right off of Milledge Avenue. It features a great area for kids to play, a nice pond, a great walking path and is walking distance from Bear Hollow Wildlife Trail & Zoo. For dog owners, a short walk up the hill and you will find a completely fenced in area for dogs to play off-leash. The park is open until dusk and there is no charge for admittance. The park has a 260-acre lake & offers fishing, canoes, & paddleboats, a swimming beach, playgrounds, woodland hiking trails, tennis courts, picnic facilities, softball, volleyball, basketball, & more. Fun activities for the whole family. Dogs are welcomed on the trails as long as they are on-leash. 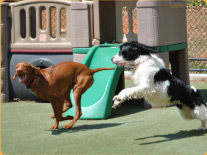 For off-leash fun, Sandy Creek offers both a dog park for everyone's use or private dog parks that can be rented for $1/dog per hour. These parks are completely fenced-in with nice grassy fields. They even provide water bowls that can be filled with water from pumps located in each park. There is a fee per person for park admittance. 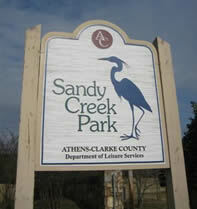 Sandy Creek Park is located off of Holman Road (off of 441 South.) Call the park for hours. Follow the road through the soccer fields of UGA and you'll find an off-leash area perfect for playing with your dog. Park near the metal gate and walk down the gravel path and you'll see the signs indicating which areas are designated for off-leash fun. You'll find several open fields along with winding paths perfect for a nice afternoon jog. Park is open seven days a week until dusk. 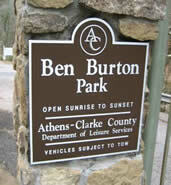 Ben Burton Park is located directly off of Mitchell Bridge Road. It does not have any areas designated for off-leash play, but dogs on leash are welcome along the paths, the open fields and to play in the river that runs through the park. Park is open seven days a week until dusk. Call Athens-Clarke Leisure Services Dept. for more information. Never heard of Doggie Daycare? The benefits of allowing your dog to attend doggie daycare are astounding. For young dogs it teaches them invaluable social skills that will help them learn how to properly meet and interact with a variety of other dogs. It also helps young puppies with their potty training because we keep them on a very routine potty schedule. 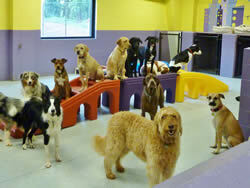 See an extended explanation of dogs in packs in the benefits of doggie daycare. Very hyper dogs are given a proper outlet for all of that energy. That way, you can simply relax and enjoy their company at home and not have a dog demanding attention and exercise. Some owners say we have a “Pawtropolis Weight Loss Plan.” Not really, but we've noticed dogs needing to shed a few pounds can do so by playing in the playgroups all day.